Versions of name: Manecken Hof? Year of construction: 16the c.
This manor formed on an island in Daugava - Kojusala, which nowadays is part of mainland. Manor has not been preserved. Name of the manor comes from the manager of Riga harbour Andreas Koje - he is mentioned as the landlord of Kojusala in 1596. His posterity lived here also in 17th century. Kojusala manor had a status of so called "chivalry manor" kept up to 1899. At the end of 18th century island was connected to mainland and here was created Kojusala garden (Pig garden, Moscov garden) - it was located in the site of former Mazjumprava manor taven ar the old Riga - Moscov tract. This was one of the oldest gardens in Riga and was popular place for recreation. In 1754 the garden became property of Riga city. It was divided in building plots and densely built up in 19th century. Water body between the former island and mainland at the other half of 19th century was rented out to wood merchant company "Jēkabs Dombrovskis", they rented it for several decades. In the work of J.C.Brotze (2.) 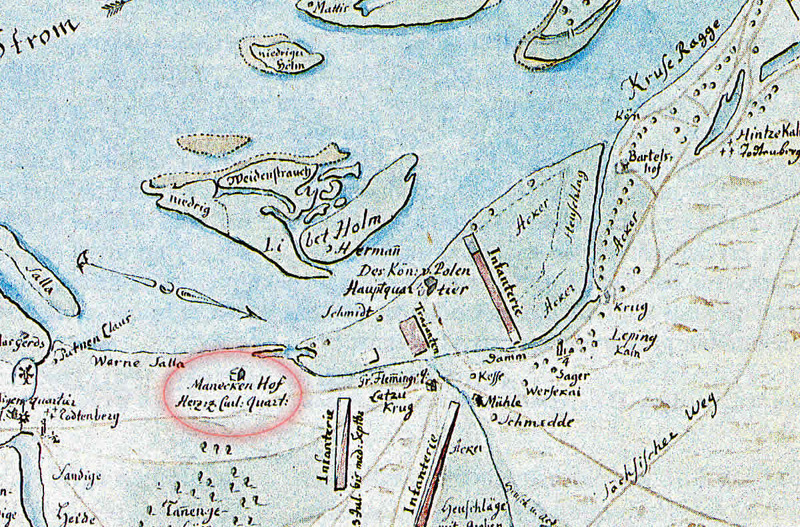 in a map approximately in the location of this manor there is marked "Manecken Hof", below there stands an illegible inscription "Herz:zu:Curl:Quart:" - possibly marking a location where has resided some military commander (duke of Courland?). Manecken Hof in the map of E.Tolk, redrawn by J.C.Brotze, fragment. 1700. Ozoliņa D. Kā Rīgas "bruņinieku" muižiņas nonāca pilsētas pārvaldes pakļautībā (19./20.gs. mija), Senā Rīga. Pētījumi pilsētas arheoloģijā un vēsturē. Rīga, Latvijas Vēstures institūta apgāds, 2003, pp.332.,336. Villeruša V. Gājums, Rīga, Kabata, 1994, p.24.